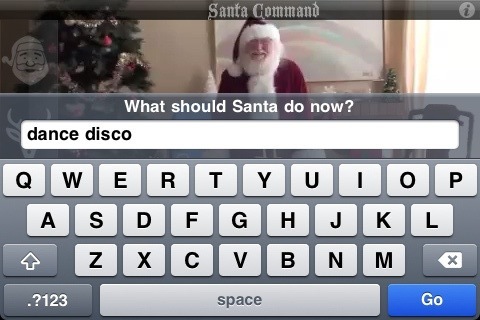 “What should Santa do now?” That’s the question in the Santa Command iPhone app from White Dove Creative Studios. The app loads a guy dressed in a Santa outfit who is standing there waiting for you to type in some commands. Have you ever wanted to give orders to Santa Claus? Then here’s your chance. Just tap on him and a keyboard slides up where you can type in any list of commands you can think of. Hit go and watch as Santa does what you asked him to do. Santa Command’s surroundings have some of items sitting around that you can name in your commands. There’s a Christmas tree, there are boxes of presents and a series of toys. If you need some ideas, tap the green bottom corner to see the hint list. Surprisingly there are a ton of things he can do, and if you type stuff that Santa can’t do, he gives you a little shoulder shrug. Some of the acts are performed with the help of one of Santa’s little elves and Mrs. Claus makes an appearance here and there. The app does promote some of the the other apps for you to purchase. And there’s a bonus section too. A semi hidden video in the app shows you how to make your own fake snow powder from basic household items, and you can also find a supply list for making your own snow. 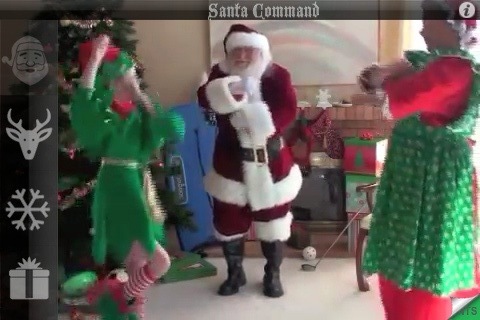 Overall, Santa Command is a pretty fun app for the holiday season. The app has a ton of videos which make it a whopping 171MB in file size, so you gotta download it while you have a WiFi connection. For now the app is free. Grab it and have a few laughs with your friends and family. AppSafari review of Santa Command was written by Joe Seifi on December 23rd, 2010 and categorized under App Store, Fun, Video. Page viewed 3592 times, 1 so far today. Need help on using these apps? Please read the Help Page.